Being an open graphic library, we can draw different shapes such as circle, triangle, square in JOGL. Hence, to draw these shapes Open GL provides primitives that facilitates JOGL to draw 2D as well as 3D dimension figures. OpenGL Primitive provides various in-built parameters on the basis of which different shapes can be drawn. Each parameter has some specific role in drawing figure. GL_LINES It treats each pair of vertices as line segment. 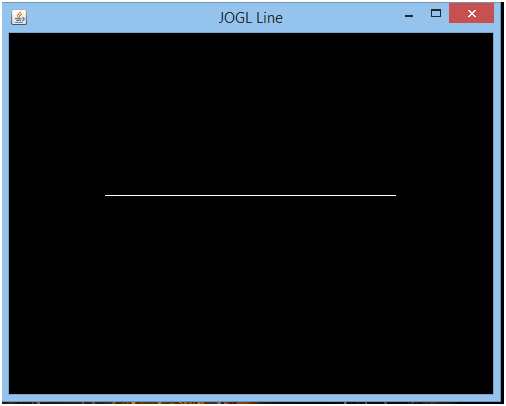 GL_LINES_STRIP Connects group of line segment with each other. GL_LINES_LOOP Connects group of line segment in a loop i.e. from first to last and then back to the first. GL_TRIANGLE_FAN Creates a connected group of triangle where each triangle is defined for a particular vertex presented after the first two vertex. GL_TRIANGLE_STRIP Connects group of triangle with each other. GL_QUADS Each group of four vertices behaves as an independent quadrilateral. GL_QUAD_STRIP Connects group of quadrilateral with each other. GL_POLYGON Draws a single, convex polygon. Initially, pass the object of GLAutoDrawable interface with display() method as its parameters. Generate the object of GL2 interface. Associate that object with glBegin() method and pass the type of primitive required as its parameter. Here, we are providing GL_LINES primitive. Now, bound GL2 object with glVeretex2d() method and pass the specific coordinate with it. End up the line by invoking glEnd() method. In this example, we will learn how to draw a simple line using primitives.